Both Aaron and I love beets. i picked these up at the Irondequoit Farmers Market. I had a beet salad at an Italian restaurant in Chicago that I wanted to recreate. First I roasted the beets. This couldn't be easier. I wrapped them in aluminum foil and put them in the oven at 400 degrees for one hour. 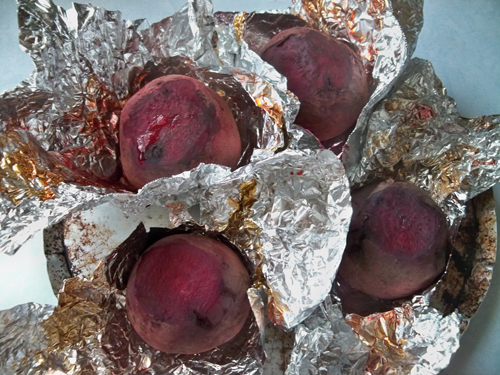 I read a tip once that to easily skin roasted beets just rub them with a paper towel. It really works! I love the color of beets! I couldn't find a recipe online for a beet salad that was just like the one I had in Chicago, so I sort of made it up as I went along. 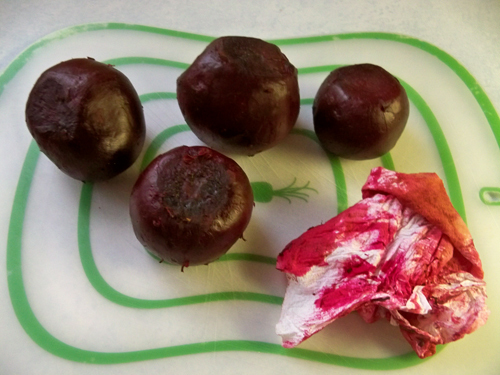 I sliced the cooled beets and arranged them on a plate with some baby salad greens. Next I sprinkled crumbled feta cheese and glazed walnuts on top. Then I drizzled some extra virgin olive oil and a balsamic vinegar sauce over everything. The sauce is just a quarter cup of balsamic vinegar and a quarter cup of sugar warmed on the stove until the sugar disolves and it is velvety smooth. The salad was sooo good! We will definitely be having this again. 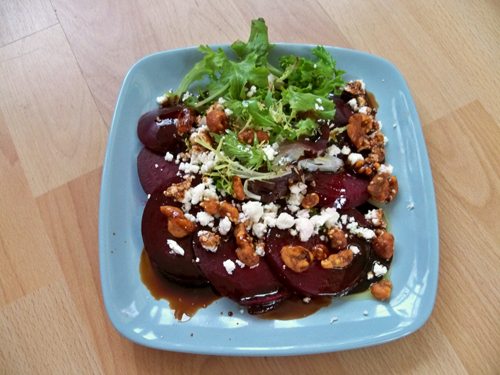 Try roasted or pickled beets with strawberries, goat cheese, walnuts, olive oil, and balsamic glaze (I just reduce it on the stove) over a bed of arugula. It is my favorite summer salad! 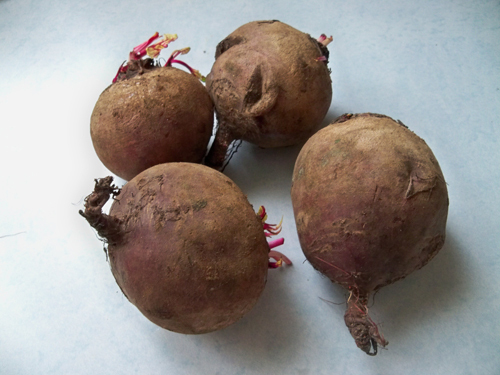 OMG I love beets. Must try this. Thank you!